Here i have a excel tool for do analysis on AWR Repository, I have developed it with VBA language (Visual Basic for Applications). This tool is capable for create normal and pivot charts (bar, lineal, area, etc.) for every metric (topquery, event waits, sysmetric, systat, etc.) for every Rac Instance. For instance, with this tool you can show charts about the top querys, top event waits, top sys time model, sysmetrichistory, database growth, etc. for any date you want. And the connectivity to database is so easy, I use the same Oracle Client for do connectivity. For instance, the first page is called "Inicio" in this page you should to enter the ip address, port, service_name, username and password for database. 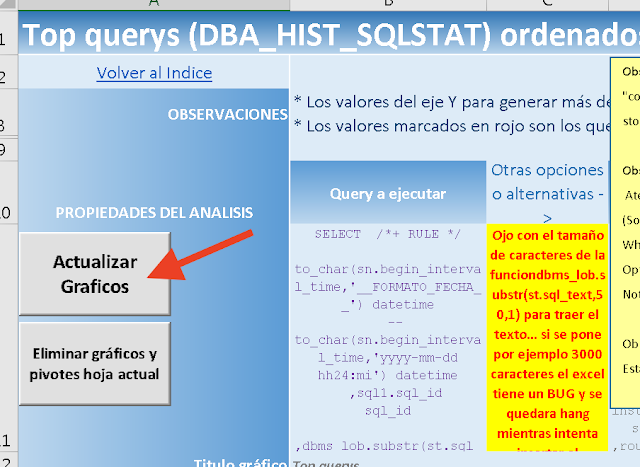 And after that you can go for example to page is called "TopQuerys" and the only thing you should to do is click en the button "Actualizar Grafico" for generate the top querys chart. That information is the same for all sheets for the worksheet, so in this way you can review systimemodel, sysstat, topquerys, topobjects I/O, and more. I hope the worksheet it would be great helpfull for your performance analysis. Please don't change the code or change my copyright.